There hasn’t been a post lately since we unexpectedly left town last Thursday. Josh’s brother died suddenly and we were off to be with family. The boys certainly had tons of fun with their cousins, hopefully they provided comedic relief during the grief filled days. I find one of the hardest parts of traveling and being away from home to be eating well. I tire quickly of eating out. It is difficult to maintain my necessary high fiber diet when eating out. There are only so many times I want chili or bean burritos! Restaurant veggies are also usually small servings compared to my usual veggie serving sizes at home. We did manage to find a couple great local restaurants which was nice. We also visited some of Josh’s favorites, not exactly health food places. The boys LOVED the hotel breakfast buffets. They can certainly pack it in, eating everything they don’t get at home like donuts, sugar cereals, chocolate muffins, Belgian waffles, yogurt, fruit, eggs and sausage. Yes, Ewan really did eat all that in ONE meal! One thing that also surprised me was that my sister in law didn’t receive any homemade food. Don’t get me wrong, she had many friends being food by, it was just all store bought or take out. Every other time I’ve been to somebody’s house after a death they usually are overwhelmed with casseroles, desserts etc. Everyone brings their best. Is this a change of the times, people don’t cook anymore? Just an observation that puzzled me. We got home late Tuesday night so Wednesday morning it was yogurt for breakfast and leftovers for lunches. I managed to scare up some sausage and veggies over polenta for dinner so I didn’t need to go to the store that day. I even had bread dough in the fridge to make some fresh bread. This morning was a little trickier. I still hadn’t been to the store. The boys where thrilled to discover the leftover homemade bread with Nutella. Not our usual so it was a treat for them. The mangoes I bought before we left town were ripe so we at least had fruit to go with it. It is good to enjoy home cooked food again. I missed it! The best part is that the boys still enjoy good food. You never know what will happen when they eat junk food for an extended period of time. 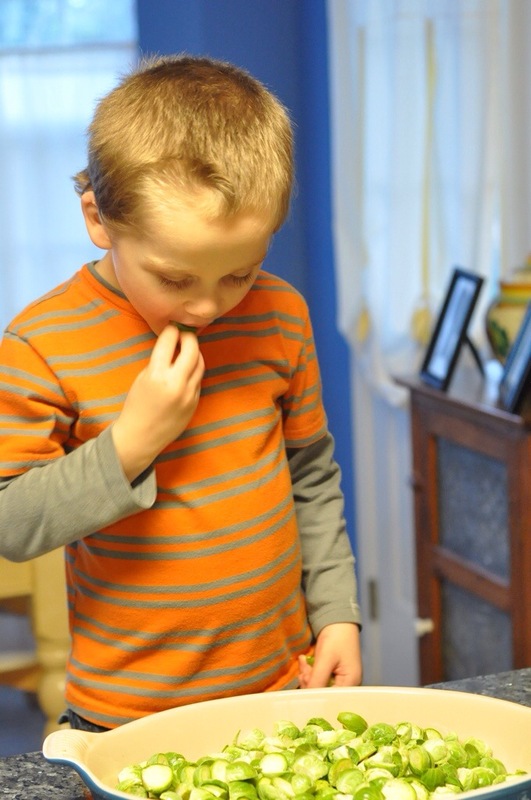 Here is Sean eating the Brussels sprouts as I cut them! I love it when they enjoy fruits and veggies without any prompting! Tomorrow we have another blip in our better eating plan. It’s Father Son Fun Night at school which includes a pizza dinner, store bought cookies and lemonade. Detox again on Saturday! Oh well, you win some you lose some. All in moderation. So that sums up what we’ve been eating and doing. More recipe posts to come next week, assuming life returns to “normal”. Sorry about the photo quality. Lighting isn’t exactly good at 6:15 in the morning or 6 in the evening this time of year! This entry was posted in Travel on January 23, 2015 by Gretchen. 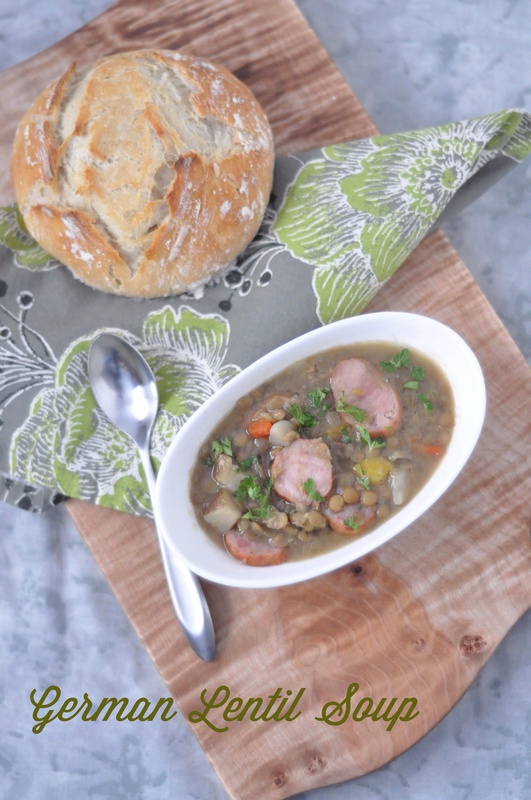 This entry was posted in Soups and tagged easy, Eintopf, gluten free, hearty, high fiber, Linsensuppe, low fat, sausage on January 14, 2015 by Gretchen. 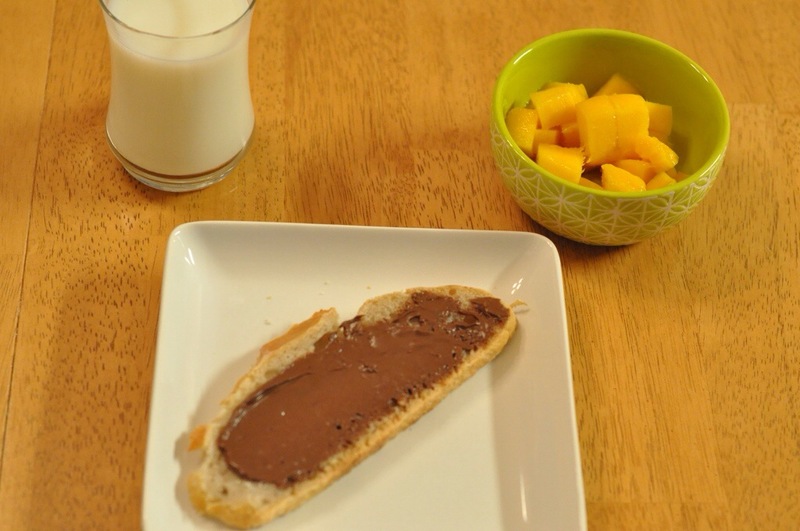 It’s a new year and many people tend to start eating healthier right about now. We try to eat a well balanced diet year round at our house, though during the holidays with so many Christmas cookies, fudge and other goodies around it tends to get sugar heavy. It doesn’t help when I have three boys who sneak things, like the cookies their Grandma brought that I had in the garage freezer. Let’s just say there is powdered sugar everywhere! Seems I can’t hide things in the freezer anymore, I’ve been found out. 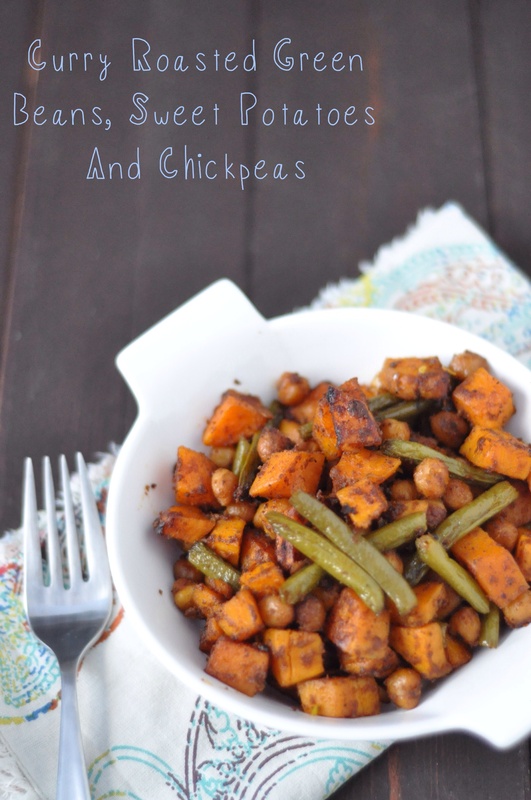 This entry was posted in Vegetable Sides and tagged chickpeas, Curry, gluten free, green beans, healthy, high fiber, My Favourite Pastime, Selma's Table, sweet potatoes, vegetarian on January 6, 2015 by Gretchen. How did it get to be a new year already?! The holidays came and went, now is the aftermath of cleanup. More importantly, school begins again in a few days. Yeah! 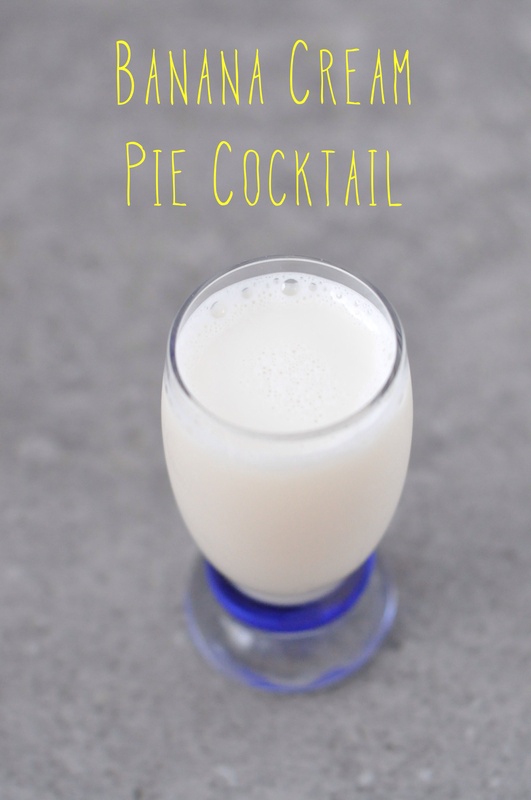 Anyway, it’s time to join Celia at Fig Jam and Lime Cordial for another In My Kitchen post. Things were busy here as usual over the holidays. Josh’s mom was here for nine days so we were up to our usual chaos plus a houseguest. Everyone had fun and now it is back to reality. We baked lots of cookies and several cakes as gifts and some to keep. In all the madness though, I realized I didn’t get a single picture. So this month it seems there are no food pictures for my IMK post, but believe me, we ate plenty this month. And all delicious! This entry was posted in In My Kitchen and tagged appliances, In My Kitchen, Meissen on January 2, 2015 by Gretchen.